Being in tandem also means it is quicker to set up the kite, solving problems and communicating is easier too. The only problem is that the front person must channel the power to move the buggies and two people (280kg) through their legs. Due to the inertia, starting and stopping is like driving a tanker.This was made more apparent as I face planted the side of a dune for the fifth time, after being lifted out of my buggy after trying to get moving. As I came to an abrupt stop ten metres away (on my face) I was glad I was wearing a full face helmet! 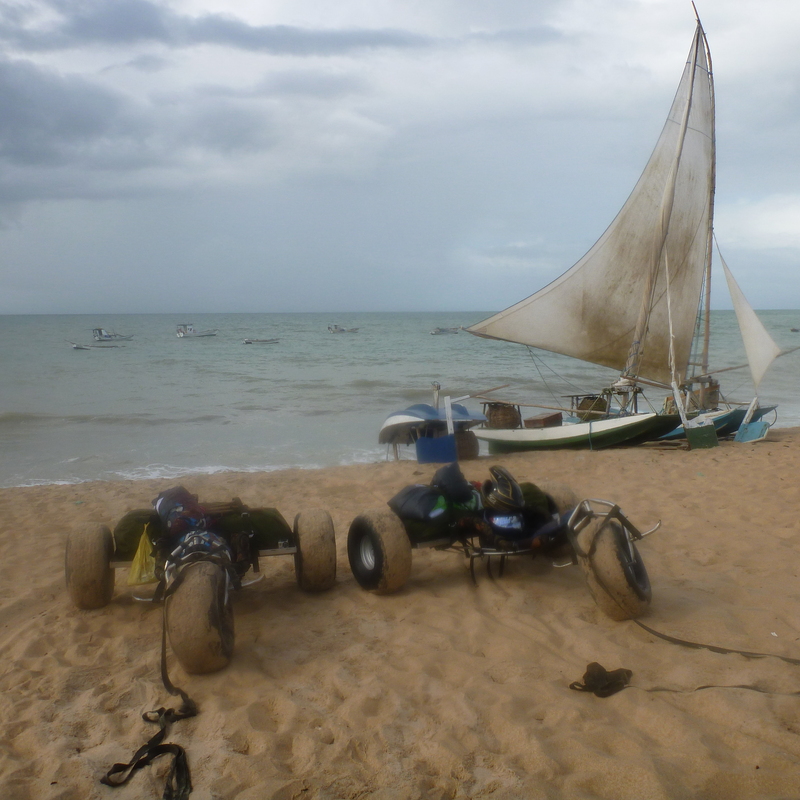 Out of Buggy Experiences (aka OBEs in the kiting world) are all too easy to have when the winds are high and you are towing two buggies, especially in thick sand. Despite this we still made good progress to Enxe Quimado. The tide had made it impossible to go beyond this fishing village. With tyres in the sea on one side and palm trees and barbed wire fences threatening to catch the kite on the other (Charlie has got quite good at scaling trees to rescue the kite when they do) we had no choice but to stop. For many of these north eastern coastal towns the beach is the only road, so the tide dictates when people can travel. Even at low tide, it is a little nerve racking coming up to a headland with no brakes and navigating a course under the cliffs, hoping that the tide is low enough to pass all the way through. Despite some tight spots we have been lucky so far and have only had to turn back a handful of times. The Outlaw buggies, Buggy Bags and Ozone kites have been awsome so far and have shown no signs of stress under hard use. At Enxe Quimado, there were no Pousadas but a group of local children got their English teacher (who was delighted having never met an English speaking person) to translate for us and show us to a house where we could put up our hammocks for the night. We still haven´t seen a single tourist despite the beaches being some of the most beautiful as we have ever seen – the people are increibly friendly and always eager to help. After another day of hard kite buggying we are now at Caiçera planning the next stage of the route. There are two massive river delta systems we need to pass – anyone know of any fisherman in Galinhos?! This entry was posted in Buggies, Buggy Bags, Buggy Bags, Computer Solutions, Craig Hansen, Gear, Journal, Kites, Ozone, Sponsors by Harry Thuillier. Bookmark the permalink. In the main bay at Galinhos, I stayed with a cool couple. He is Argintinian and she is Brazilian. It’s a house on the left next to the main pousada in the main bay. Will try and look for some more details for you. sorry its a bit vague. Thanks Louis, we`ll look out for that house. In the meantime any more details would be sweet. Here is Clenio… the guy you met at the begginer of your trip at Barra do Rio beach (nearby Jenipabu beach). Just to let you know… there is a boat that can get you from Galinhos to Guamaré… and there you can continue the trip! Take care! and have safe trip! Thanks Clenio – will check it out! seatbelts. they stop the out of buggy experiences… you can hold so much power..
Seatbelts would be great – but then I`d be worried that without a roll bar I`d get a buggy on the head too – happy just to leap out at the moment! Mum’s brought me up to date, with as much as you tell her! You know you have my admiration & respect as all do who follow their own dreams. Congratulations to you both. No special tricks needed for me just come home safely so that you can write the book. Email waiting for you when you get home, no reply needed. Thanks Susan, and thanks very much for your kind donation! There have been quite a few challenges but we’re enjoying them all (if not during the actual event!). I hear you’re planning a trek too, hope that goes well.